6) Discussion on next steps to the District Administration based on various assessment results. 7) Any other item with permission of the Commissioner of School Education. They are requested to attend the video conference on 29-3-2018 from 4.00 pm. To 6.00 p.m. at their respective districts along with Dy.EOs, AMOs, DCEB Secretaries and District Assessment Cell members and also with relevant information without fail. 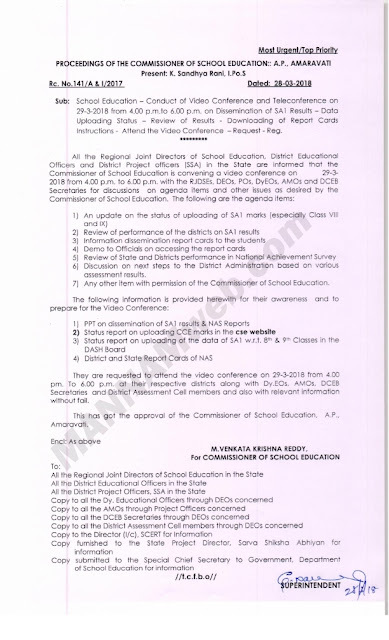 This has got the approval of the Commissioner of School Education, A.P., Amaravati.